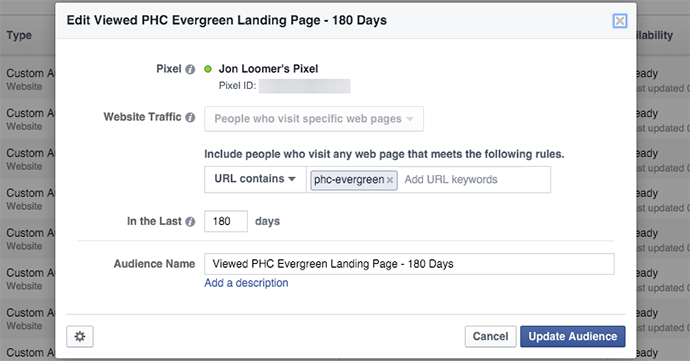 Much of the confusion about Facebook advertising among novice to intermediate marketers centers around the lack of specificity in training materials available. They speak in generalities and in theory instead of providing specific examples and step-by-step instructions. I try to do things differently here, sharing as much detail and as many examples from my own advertising as I can. 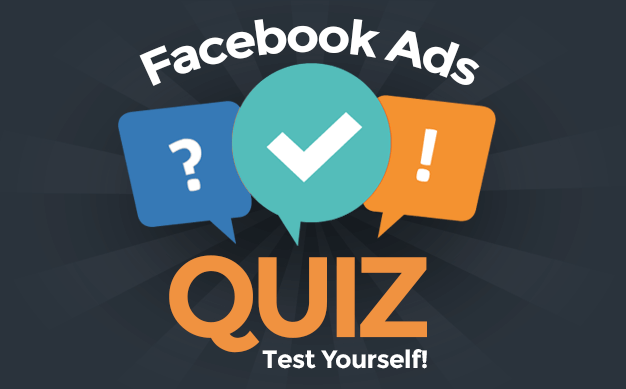 Today, I want to dive into a rather complex topic that confuses many marketers looking to take advantage of the power of both Facebook ads and email. 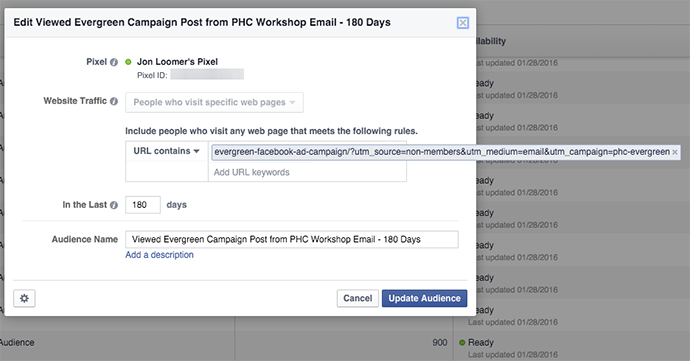 Here’s an important point that you need to understand: When you run consistent messaging to the same audience via both email and Facebook ads, they make each other more effective. The email campaign by itself may have done fine. The Facebook campaign by itself may have done fine. Combine the two, and not only do you combine the results, but the familiarity from the email (on which a user didn’t act) could make action on an ad more likely (and vice versa). I don’t always combine the two because it can be a bit complicated, but when I do the results are often magical. 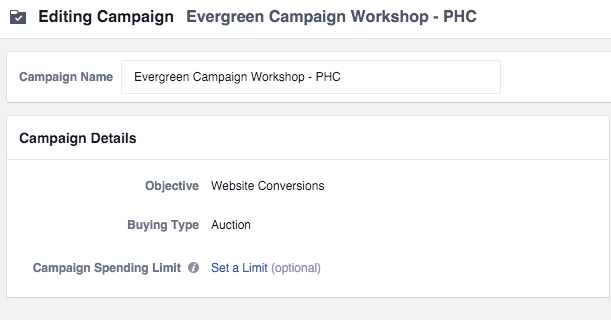 Today I want to provide the details of how I’m promoting my How to Create an Evergreen Facebook Campaign Workshop with both email and Facebook ads — and how they work together. 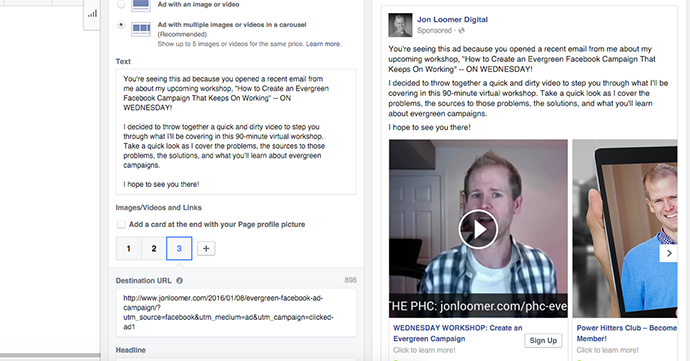 So let’s take a closer look at the basics of my email and Facebook campaigns and how one influences the other. I will simplify some of this as there are some complexities that may add unnecessary confusion to this blog post. On Wednesday, January 27 (a week from the workshop), I wrote an email to most of my list. I started broadly, excluding only people who are current members of the Power Hitters Club (who are automatically registered for the workshop). 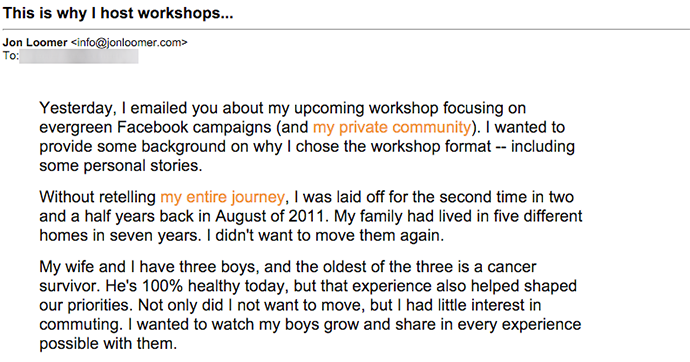 The goal with this email was to introduce the workshop and my Power Hitters Club membership to this audience. The following day, I sent a second email to those who opened the first one. This time, I took a different approach. I shared some history about why I teach using the workshop model, providing some personal stories along the way. 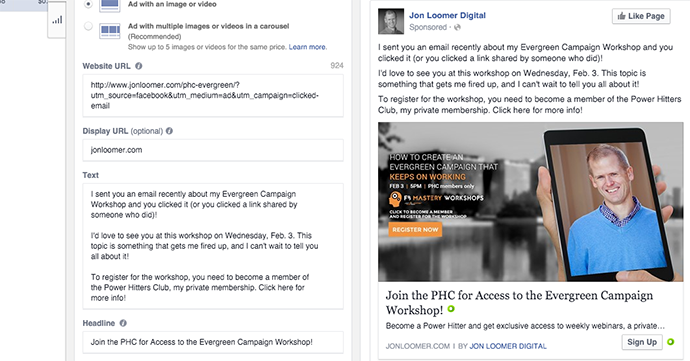 Both emails shared a couple of links: One was a link to a special landing page for recipients of this email and another was to a recent blog post I wrote about the evergreen Facebook campaign concept. (There was also a link to my “About Me” page in the second email, but that didn’t impact the campaign). I added UTM tags to the end of the blog post URL — not necessarily for tracking purposes, but so that I could create a special Website Custom Audience for it. The truth is that I probably didn’t need to create a separate landing page for this campaign. I could have also used UTM parameters for it as well. But let’s not get bogged down into unnecessary details. The main goal here was to drive traffic to these pages so that we could then target those people with corresponding Facebook ads. The more traffic I can drive, the more people I will target on Facebook. In the past, I’ve been known to hit my entire email list multiple times with promotions for my products. But now that my workshops are only available for PHC members, I find that to be overkill. In between, I will also email my list to promote this blog post. That email will include a mention of the upcoming workshop and a link to that special landing page. Again, the hope is to drive as many relevant people into that Facebook funnel as possible. We now want to piggy-back off of that email and start running Facebook ads targeting those who have clicked my emails. Note that I considered widening the net and targeting anyone who opened, but I felt that could pull in too many accidental opens. I created a campaign with the objective of Website Conversions. For simplicity’s sake, we’re only going to focus on the first two. Understand that the primary strategy here is that we’re going to show one ad to someone who clicked on those links in my email for the first two days. Then we’ll show them another ad for the next two days before showing a final ad. I set a $100 daily budget because that budget needed to be at least double the manual bid of $50. I set a $50 manual bid to make sure that I reach as many of these people as possible — knowing that I ultimately won’t spend either $50 in CPM or anywhere close to $100 for a daily budget. I use Daily Unique Reach because I have an incredibly relevant (and small) audience, and I want to reach as many of these people as possible. However, I also don’t want to bombard them over and over, so I limit my frequency to once per day. This is also why I didn’t use the right column placement. Since I’m using Daily Unique Reach, I don’t want to waste my one impression per day on the right column. I don’t do any country or language filtering. Even though my email was not targeted at current PHC members, I know that some of those recipients will then become new members. As a result, I want to be sure I exclude them from this campaign. This is a simple link ad driving users to a UTM-altered version of that same landing page. I did this so that I can then create a Website Custom Audience for that URL and exclude anyone who clicked the ad already from this particular ad set. 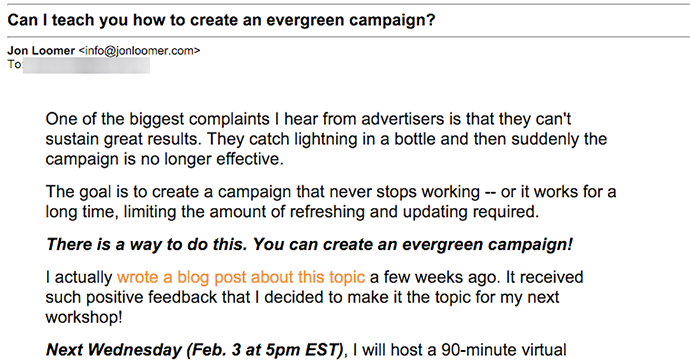 You’ll note that the copy calls out the fact that those seeing the ad received an email from me. Increased relevance! With this ad, I wanted to do things a little differently. I created a carousel that included a special video that highlights what will be covered within the workshop, a UTM-altered link to the landing page and a UTM-altered link to the blog post. This should give you a clear picture of my strategy, but know that I’ll also have an ad set for days 5-6 to show yet another ad. I am still early in this campaign, but this approach tends to work very well. 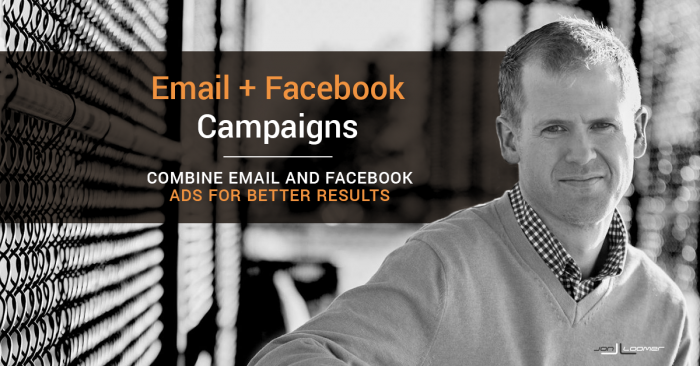 Both email and Facebook ad campaigns will drive conversions at rates that are often higher than if used by themselves. While saving money wasn’t necessarily a priority, note that this certainly is a way to focus budget without wasting it. Even though my bids are high, I’m only targeting around 1,000 people who have expressed interest in this workshop. Spend will be low, but return should also be high. What are your thoughts on this approach? Have you ever tried something similar?